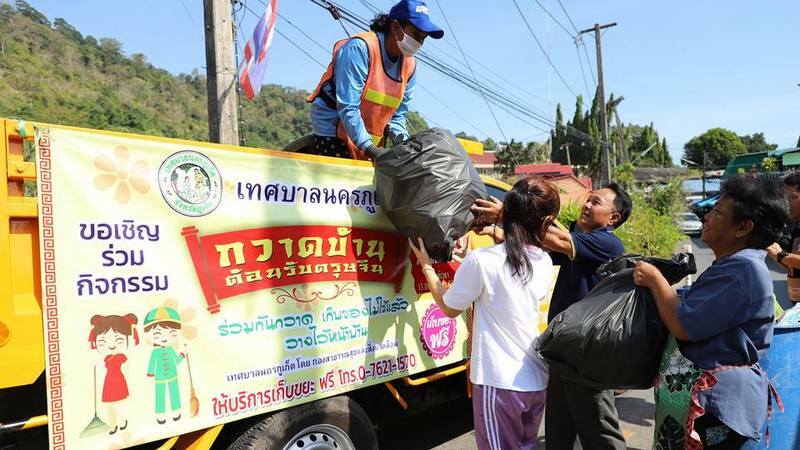 PHUKET: Phuket City Municipality is calling on people to clean out their houses ahead of the Chinese New Year festivities, which this year falls on Feb 5. People throughout the town can place all their old items, including furniture, neatly along the street and have it collected for free, the town council has announced. Mae Luan Rd, Soi Phithak Thawip, Soi Phikun Thong, Soi Pan Thep 1-3, Soi Su Santi 1-4, Sot Si Apartment 1, Soi Phoe Gui, Soi Mri Sao, Soi Hong Leng Uthid, Surakul Village, Wichit Rd (incl Soi 1-4), Soi Mae Liew, Soi Ronglek, Satun Rd, Krabi Rd, Soi Wat Khachon Rangsan (from Khao Rung Intersection to the old ‘Slaughterhouse Intersection’ of Pattana Rd, Bangkok Rd Chaofa Rd and Wirat Hongyok Rd), Soi Noppakoon, 131 community, Pattana Rd (incl Soi 1-6, 8, 10, 12, 14), Soi Loarong, Wirat Hongyok Rd. Damrong Rd, Satree Phuket School, Soi Cherng Kiri, Soi Ta Pae, Damrong Rd Soi 2, Soi Sarawat, To Chae Rd, communities behind Phuket Provincial Hall, Palian Rd, Kamnan Rd, Soi Ta Toon, Soi Phutorn Newspaper, Amphur Rd, Soi Phakun Sangkom, Soi Tunjua, Phu Yai Baan Rd (incl Soi 1-5), Trang Rd (incl Soi 1-5), Thepkrasattri Rd (from Satree Phuket School Intersection to Thaw Num Intersection), Soi 2 Suthat community, Suthat Rd (incl Soi 1), Luang Por Rd, Luang Por Community, Kulawadee Village, Narisorn Rd (incl Soi 2,and 4), Thesar Rd, Surin Rd (incl Soi 1-4). Anuphas Phuket Kan Rd, Hatchana Niwet Village, Si Sena Rd, Nimit Rd, 14 Ruam Nam Jai communities, Phun Phon Bridge 1 Community, Phun Phon Bridge2 Community, Khum Num Nor Lahat Community, Soi 1-5 Chao Fa Rd, Soi Im Chit, Soi Pha Sook( Soi Kong Prap), New Sakdidet Rd, Tha Krang Rd, Soi Phian Uthit 1-6, Sakdidet Rd, Soi 9 and 11 Sakdidet Rd. Montri Rd, Soi Surin, Thalang Rd, Soi Rommani, Thepkrasattri Rd (From Toa Po intersecton to Thalang intersection), Phangnga Rd, Soi 1-3 Phangnga Rd, Virapong Hongyok Rd, Ratsada Rd, Ranong Rd, Soi Wiboon Rungsan, Soi Phutorn, Phoonpon Rd (incl Soi 1, 3, 5, 7, 8, 11 and 13), Phoonpon Night Plaza, Bangkok Rd, Soi Prawat, Rattanakosin 200 Pi Rd, Phuket Department of Juvenile Observation and Protection (DJOP), Phuket Provincial Employment Office, Baan Thanarak Phuket. Kra Rd (incl Soi 2, 4, 6, 8, 10), Soi Takua Thung, 40 Hong Community, Tilok-U-Thit 1 Rd, Tilok-U-Thit 2 Rd, Ong Sim Phai Rd, Soi Thavon Wongwong, Chana Charoen Rd, Phuket Rd, Soi Saksit, Soi Tri Sin, Soi Hap Ek, Soi Ko Phai Community, San Suk Community, Soi San Suk 1-2, Soi Jan Ussa Wasook, The Metropole Hotel Phuket, Takuapa Rd, Soi Taling Chan, Ao Kae Nai Community, Soi Saphan Hin, Soi Lim Sui Ju, Ton Pho Community.